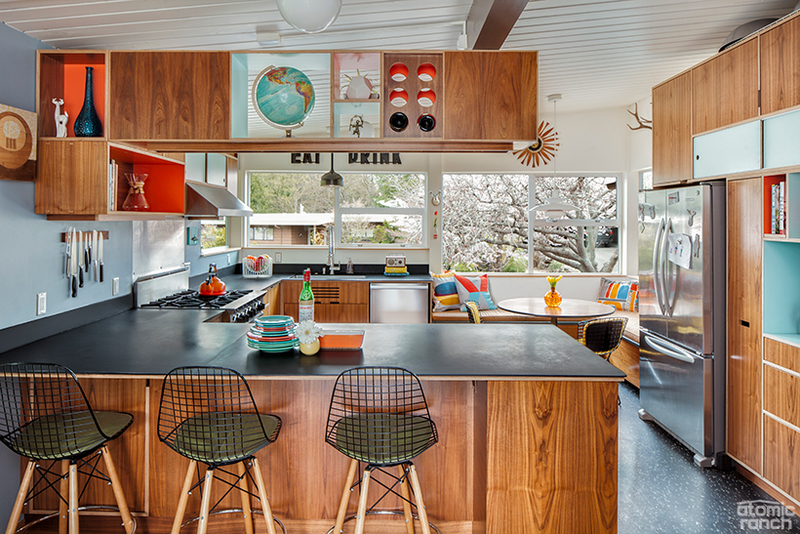 When George and Mary bought their midcentury home in 2007, it came with a somewhat original kitchen. “There was a wall where the peninsula is [with a] very small pocket door—the kitchen felt small and closed off from the rest of the house,” Mary says. The cabinets and car decking (also known as tongue and groove) ceiling had been painted, and the countertops, sink, fridge and dishwasher had all been updated. Despite this desire to bring the kitchen together with the living space, George and Mary were set on staying true to the aesthetic of the home’s period while also bringing what they call a “modern energy.” “We fell in love with Kerf Cabinetry thanks to Atomic Ranch, and much of the design was done around the cabinets,” she says. The Campbell kitchen is proof that in the renovation process, the right team makes all the difference. Architect Prentis Hale of SHED Architecture & Design kicked off the project when George and Mary purchased a block of time with him at a charity auction. He met with the couple, went over their needs and came up with the sketches that inspired the final project. At the recommendation of a friend, next came the team at Fivedot Design/Build, including Geoff Piper and Sharon Khosla— who helped bring the Campbell’s Kerf dreams to life. 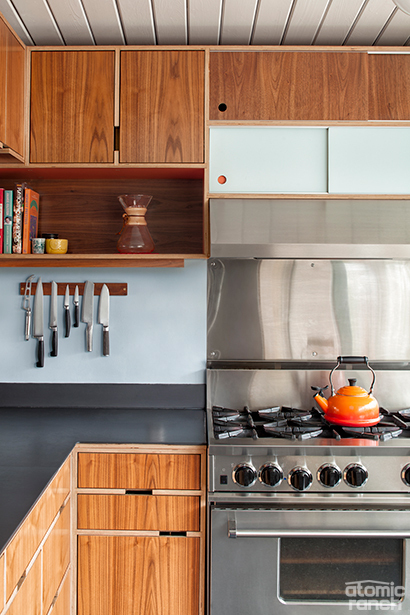 “We designed custom cubbies in the pantry to hold and show off her bright orange Le Creuset cookware and a mixer too,” says Nathan Hartman, owner of Kerf Design. The Campbells and their design team found it difficult to add ceiling fixtures due to the original paneling, which had been painted white by a previous owner. To combat this issue, they ran a conduit along the ceiling. Following a nine-month design and build process, the Campbell kitchen was completed in 2011. The 190-square foot space was transformed thanks to custom cabinets, a peninsula that replaced the former dividing wall, as well as plenty of space for friends and family to gather. The kitchen features a combination of sliding and hinged doors, as well as plenty of drawers. The storage beneath the peninsula is entirely drawers. However, the real star of the kitchen is the Kerf cabinetry with walnut and colorful accent veneers. “It was important to us for the kitchen to fit with the style of the home without feeling too retro. 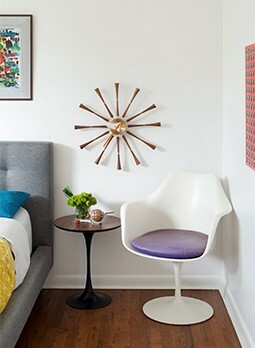 We wanted something bold and unique, and loved the elements of color and wood—a definite nod to the palette of the midcentury period,” Mary says. Geoff added upper storage to the kitchen by designing a bank of hanging cabinets over the peninsula. What was once a wall now acts as seating for casual dining, a serving space and storage—all without compromising on the kitchen’s connection to the living room and letting light in from the west side of the house. “The uppers over the peninsula are high enough to stay out of sightlines, but it allowed us to put in under cabinet lighting to illuminate the work surface,” Nathan says. The article originally ran in issue #55. 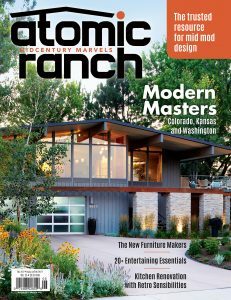 To see more of this home, furniture stories + more, order your copy online today!